Amsterdam is your starting point for this 10-day trip including a 7-night river cruise, as you follow the romantic Rhine on its winding journey from the Netherlands to the Swiss Alps. You'll experience medieval winetowns, cathedrals, castles, museums, and river landscapes of the kind that inspired JMW Turner and Richard Wagner. 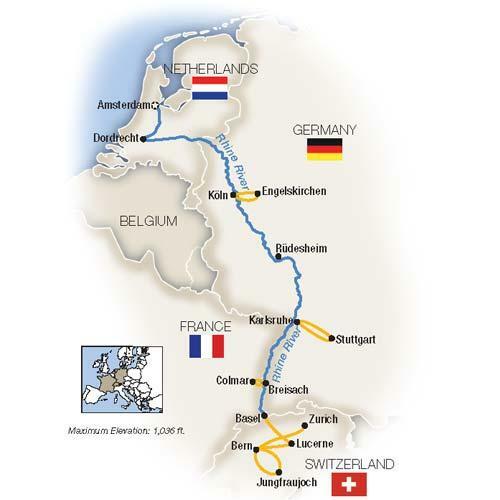 Begin in Amsterdam with a Rijksmuseum visit and a canal boat tour or a walking-and-tasting tour of the city's Jordaan district, then cruise the Rhine to visit Köln, Rudesheim, Stuttgart and Colmar. Disembark in Basel for a two-night stay at a luxury hotel in Bern, with an idyll in Lucerne and exploration of the magnificent Alps. Along the way, experience a Tauck Exclusive evening of dinner and music at Schloss Ehreshoven, a visit to the windmills of Kinderdyke, and much more!